The holidays are fast approaching and preparing gifts for our family and friends is also one thing we would like to accomplish without being beat up of the preparation. Sending them goodie stuff would be one thing that will be a hassle free for us. Gladly, that I was given by Barbara’s Hand-Made Cookie Pie to review one of the scrumptious hand-made cookie pies. I received one Oreo Crème Cookie Pie with 16 Oz, delivered through UPS one afternoon. When I opened the package, it is indeed looking very good, my mouth is drooling, and so I could not wait for later instead I took a big slice and enjoyed the goodness of Barbara’s Hand-Made Cookie Pie. 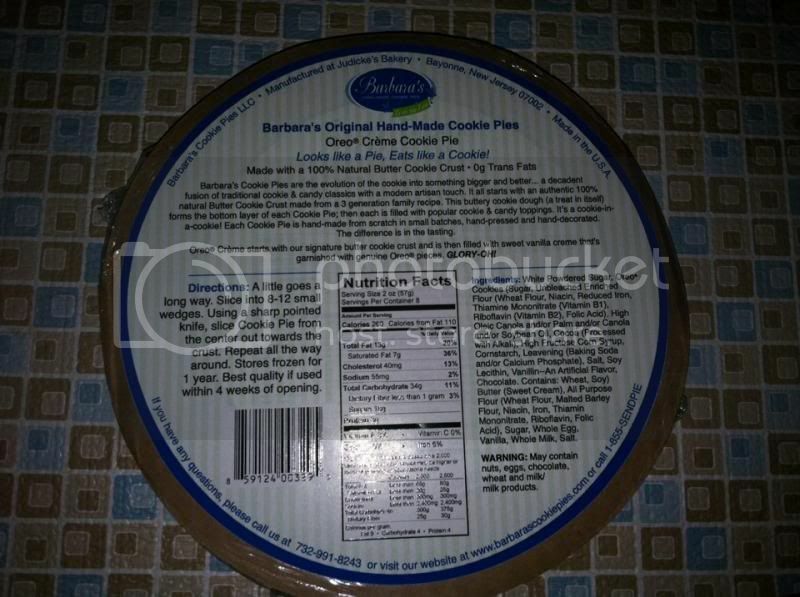 Barbara’s Hand-Made Cookie pie is made of 100% natural ingredients and butter cookie crust, no wonder why it is so scrumptious. Made in the U.S.A, and manufactured @ Judickie’s Bakery. They have plenty of selection online and the flavors are extraordinary. I want to try everything, they also do gift-wrap in case you wish to choose a custom wrapping and send it to your family or friends in other states. The cookies they prepare are fresh for you to know. You can always try Barbara’s Hand-Made pies by visiting them @ www.barbarascookiepies.com. Enjoy the good taste of the love of their affordable hand-made cookie pies; pick out the custom gift-wrap too. They have other deserts you might want to try at their website as well. This can be great for Thanksgiving dessert too, instead of baking them why not buy them. Speaking of which I have a coupon from Allens.com where you can use and save for Thanksgiving, all you need to do is visit http://www.allens.com/specials/coupon/. Please follow them on Facebook, Twitter, and YouTube to hear more about the new products they have. A disclaimer: This is not a sponsored post. 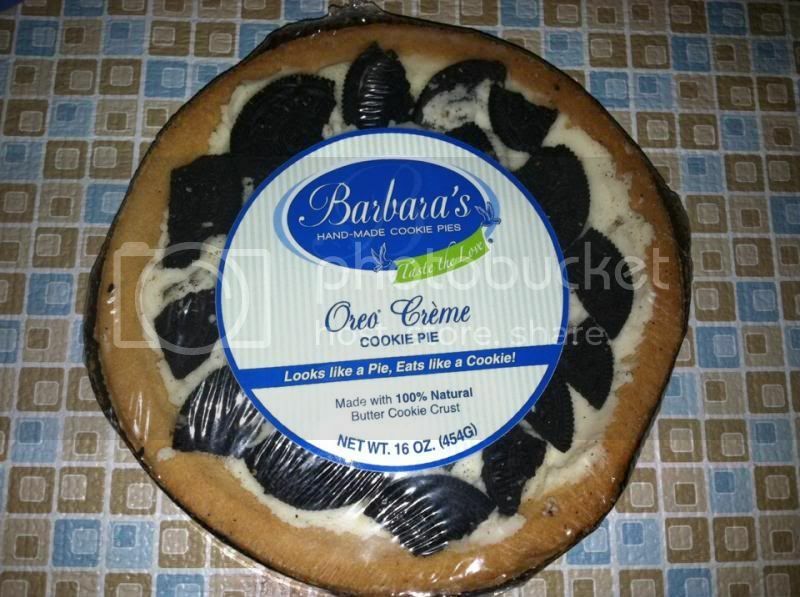 I received the Oreo Crème Cookie Pie from Barbara’s Hand-Made Cookie Pie for free in exchange of my honesty review. The outlook I expressed is 100% exclusively mine. So, you taste the delicious pie...feel hungry at once. But, if I'm eating this kind of pie, a can of cola will do. I'm sure I'm going to like this as I am really fond of sweets. oh this interests me, i am fond of butter flavored goodies:) hand-made pies sound so sweet and sincere esp when you give it as a gift to someone special. you are making me crave! This looks and sounds like a delicious treat! The Oreo Cookie Pie looks delicious. Seems yummy to me specially butter flavored. Wow! Cookie pie sounds good to me. Any kids would love that. I have had these, I love their tin filled with cookies. Perfect for Christmas. I have not tried a cookie pie yet. It must be delicious. I haven't tried their brand yet. But sure looks like yummy. My little one loves pies.